You've probably heard the news a few days ago that astronomers came up with a new definition for "planets" that added 3 new planets to the solar system (including the largest asteroid, Ceres). A couple days ago, another definition was proposed, which appears to be more consistent in some ways. However, it excludes the farthest traditional planet, Pluto. By and large, professional astronomers don't care too much one way or the other -- reactions like this (Rob Knop) and this (Phil Plait) are pretty typical. In general, what a "planet" is matters more to the general public than to the pros. Even given that, you do have to wonder what the fuss is about. It's pretty clear nowadays that Pluto is a very small object, different from the other 8 traditional planets. 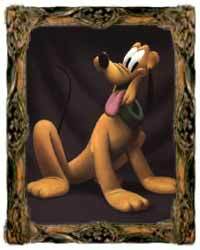 In fact, Pluto is more like the largest non-planetary bodies in some ways. Pluto is about a dozen times more massive than the largest asteroid (Ceres), but the smallest remaining planet, Mercury, is more than 20 times more massive than Pluto. Seven satellites (our Moon, the four large moons of Jupiter, Saturn's moon Titan, and Neptune's moon Triton) have more mass than Pluto. If Pluto had been discovered yesterday, or even 20 years ago, rather than almost a century ago, it almost certainly would not have been called a planet at all! So why was Pluto ever considered a planet in the first place, rather than something like a really large, icy asteroid? It turns out there is a lot of interesting history behind this, involving a couple of great planet hunts in past centuries. More below. As you may already know, astronomers discovered Neptune in the 19th century after observing slight, unexpected discrepancies in the orbits of the outer planets, notably Uranus. They deduced, correctly, that another large object was out there, slightly altering the other planets' orbits gravitationally. Furthermore, it was possible to figure out the mystery planet's location and approximate mass through careful measurements of the discrepancies. Neptune turned out to be almost exactly where it was predicted. Over the next few decades, astronomers believed they had measured further orbital discrepancies and inferred another planet's existence. Popularly called Planet X, since it was unknown, this proposed planet led to a huge search. Unlike Neptune, however, Planet X eluded discovery. In fact, an entire generation of astronomers, including well-known figures like Percival Lowell, came and went without a quick resolution to Planet X's existence. When Pluto was discovered in 1930, people initially believed it might be the long-suspected Planet X. For Pluto to qualify, it would have to be quite massive. It was, however, suspiciously faint -- less than 1/100th as bright as Neptune, but not enormously more distant. Pluto's faintness was a puzzle, since at face value it seemed to be a small body, yet a small object couldn't affect other planets' orbits significantly. At the time, there were some inventive hypotheses to explain the problem. Extremely low albedo (reflectivity) was one obvious possibility -- if Pluto's really dark, then of course it could seem dim for its size. There are some very dark objects in the Solar System, like one half of Saturn's moon Iapetus, which has been compared to soot. Another idea was something called "specular reflection", which occurs when an object behaves more like a spherical mirror than a diffuse surface. A specular reflector would look like a dark body with a small reflective spot -- much smaller than expected normally. However, this requires exotic materials and unusual circumstances, and I'm not completely sure how serious this proposal was. It took astronomers a while to be confident the "obvious" conclusion -- that Pluto was tiny -- was in fact correct. This involved ruling out the possibility that Pluto could be the long-suspected Planet X,and hence refuting (or at least showing to be improbable) the various hypotheses for that possibility. However, even when astronomers rejected the idea that Pluto could be Planet X, it was still hard to establish its true diameter. Many people tended to overestimate it even after they realized Pluto was a relatively small body. For example, astronomy popularizer Peter Lancaster Brown, in a book originally published in 1972, writes that Pluto was "probably not larger than 4000-6000 miles in diameter" (P. Lancaster Brown, Astronomy , p. 86). This is comparable to Mars, significantly larger than Mercury, and typical of what I heard when I was in elementary school a few years later. With a range like that, of course it's reasonable to consider Pluto to be a planet. We now know, thanks to updated observations, that Pluto is less than 1500 miles in diameter, much smaller than that upper bound. This wasn't really possible to know until 1978 -- 48 years after its discovery -- when Pluto's moon Charon was discovered. Just knowing the size and period of the orbit showed that the combined mass of the system (Pluto + Charon) was very small. Furthermore, astronomers observed a few occultations -- eclipses arising when a moon passes in front of a planet or vice versa. These observations gave information about the diameters of both bodies. Conclusion: Pluto really was tiny, no bigger than Earth's moon and possibly smaller. Further observations simply refined this conclusion. We also know that the "Planet X" orbital discrepancies astronomers thought they observed were simply erroneous as well. More refined measurements of the outer planets' masses, thanks in large part to the Pioneer and Voyager space probes, showed that astronomers' original figures were slightly incorrect. With the correct masses, the orbital discrepancies vanished. Planet X was never found, because it didn't exist in the first place. So why is Pluto a planet in the popular mind? It seems likely because, for much of its known history, it was believed to be planet-sized -- certainly at least Mercury-sized, if not more like Mars- or Earth-sized. This is the impression I had when I was first introduced to the planets, and it's probably true for many other people as well. Even if Pluto isn't considered a planet anymore, it's still an interesting challenge for those of us with a telescope. I first saw it as a 14th magnitude dot -- no different from the background stars -- with a 10 inch telescope about 12 years ago. It's a little farther from the Sun now, but it's still well within reach of a 10 or 12 inch telescope even from somewhat imperfect conditions. The most reliable way to find it is to get a detailed star chart, draw (or photograph) all the stars nearby, and identify which one of them moves a day or two later -- much the same way it was discovered in 1930.